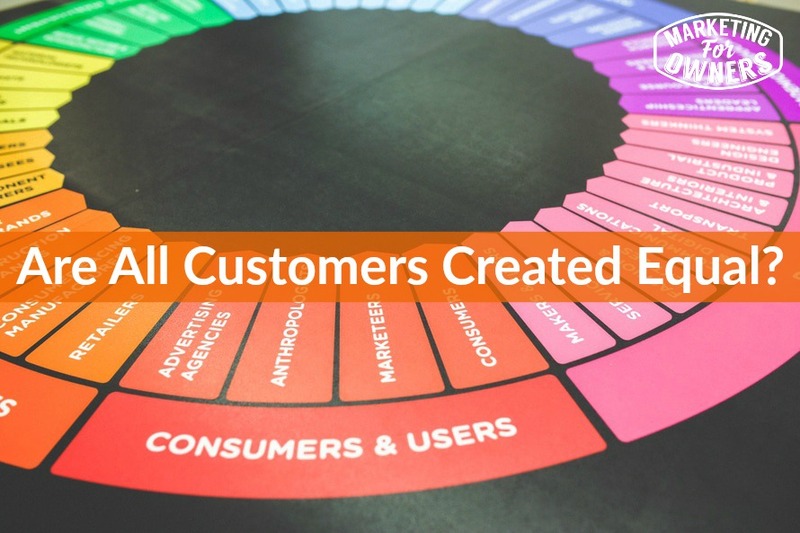 So customers, are they all created equal? The short answer is no, but I know you want a little bit more detail, a little bit more qualification and proof. No they are not. You will have top customers, you’ll have average customers, and you will have lower customers. I’m going to call them low, because of the lower type. There are probably 2 types and this is, this is rough. So I’m not talking from, I’m not a professor of marketing, or something like that. I’ve just been doing it for 30 odd years, successfully for my businesses that I start from scratch. So this is real life, this is not from a college. So in the lower terms, lower ones, you have customers that are new that have just made a purchase, they have bought once. They have not, they have not become a repeat customer yet, they have bought once, you don’t know much about them, and you don’t know they could be, could become one of your best ever, could become the best ever, you don’t know yet. You also have customers that are a pain in the neck. They are annoying, they are frustrating. They don’t spend a lot, and every time they do it, ah you have to put so much effort in. Now I used to have a customer back in my Triangle Fire Protection company days and he used to buy from us, and he was such a pain. He can order all our price rise information, and always complain that his bill was going to be different to the last one. Even if it’s just 2 percent annual price rise, we will have told him. He was so much effort that in the end I personally spoke to him, and asked him to leave us, to go somewhere else, I actually got on the phone, phoned him because he used to our speak to our customer services and it was a running joke. And I told him, I said you are obviously unhappy, I am very sorry, we cannot satisfy you, please take your business elsewhere, I give you 2 phone numbers of other companies that will look after you, and he laughed his head off. He stayed with us, he didn’t get any better, and when he moved to another company, he came back and bought with us again, he’s a good customer, just a pain in the neck. Everyone has those. You have the choice of getting rid of them, if they’re kind of consulting clients, as just buy stuff and add contracts, you can get rid of them, or you can work for them, but they take a lot of time and not worth it. Now I tried to get rid of them so I can’t tell you how to get rid of them, not very good at it. The medium ones are probably the ones that have bought once or bought quite a lot and then they’ve maybe bought again. Now again, or they buy a few times, but they don’t spend a lot of money. So good to have, bread and butter always well. Treat them nicely but are they worth spending as much time with. Not necessarily. Then you have your top customers. Your top customers are customers that are easy to deal with. They spend good money, they buy regularly, they are not customers, they are not repeat customers, they are regular customers, okay. You understand the difference. So they have, and they have potential, if there’s a regular customer, there is potential for them to buy more. There are, anytime you introduce a new product, or service, they’ll probably be interested because they trust you, they sincerely trust you. You are satisfying their needs, they think you are great, no matter what you think. You are probably thinking, I better not ask them what they think, because if they, if they tell me we are rubbish, they might go as well. But you’ve got to remember why are they buying from all the time? They think you’re fantastic. So they are a top customer, because not only do they make you money, so oh that’s another thing by the way. You may have someone who buys lots of stuff and spends lots of money, but then demands huge discounts, and it’s difficult to deal with. Not necessarily a top customer, so you have to be careful. That your top customers are people who make your life easy and make you a good profit. A healthy profit, an adequate profit. Not people that have been ripped off, people that are paying their dues and are getting value. So they are top. In Fire Protection Online, we have over a 100,000 customers. We have 3 websites, and customers vary, prefer different websites, different brands, but we know who our better customers are. Now sometimes you have someone who buys a lot regularly, just for a period of time, because they have a project and when it’s done, that was it. But we want to know. So what I suggest is no matter whether you have 5 customers, whether you have 100, whether you have 20, whether you have 100,000. And by the way, we have 100,000, they don’t buy every week. A lot of those have bought once. These are 100,000 customers on the books. Okay. But of those, figure out how you’re going to decide what is a, what, how to qualify a top customer. Do it in more than one way. Such as number of orders per year. Such as, or number of orders per period, per quarter. Such as amount of sale total, you know order total the money value, in order profit value to you, in that period. Or you can also qualify them on effort value. Some customers are just not very nice. And I know people who score their customers in the same way that they score staff, and if they are difficult to deal with, they’ll fire their customers. They’ll sack them in the same way they would fire staff. Because why should you, it’s your business, why should you have to have the hassle. And it’s not just you, your staff have to deal with them, and these people quite often upset your staff’s day, ruins their day, ruins their week. Why should they have to put up with that? Okay. But be careful with that one though. Because make sure it’s not, you know, it’s not working both ways. So qualify them, take your time to qualify them and pick. I mean, say if you got a 100 customers, pick your top 10. If you’ve got a 1000, pick your top, say 20 or 30. Then decide what you’re going to do. And I recommend, you put a lot of effort into keeping those top customers sweet. Which means you talk to them, you ask for their opinion. When you’ve got a new product, you go around and show it to them. Or if you got a new service, you’re thinking of bringing in, you go and ask them if it’s something they would be interested in, before you invest all the time and money of getting it. They then think, wow. I am respected. I am a top customer. I recommend you give them a name, whether they are platinum or something, don’t make it sound like it’s the ultimate, in case you can, gives you a leverage to create another top one, so perhaps a goal customer, or something like that. You can even create a second tier. And you could tell those people in the second tier that that they are, say they are silver, the gold ones will get this and that, this and that. And they are just a bit short of gold ones. If they just also added those to their orders, they will probably will become a gold. You can encourage people. People like to be in the top club. Those people that are a top customer, Tell them that they are, they do not let them feel say that they are, they are one of, not the top one. Don’t ever tell someone they are the top customer, because then they feel like they’ve got a bit of a hold on you. But if they are going to slip out, don’t be scared of telling someone that they’re dropped to the next tier, but don’t you worry. They’ll be looking at you in airlines. Airlines, hotels, they have levels and tiers, so this is not new to people, this is not a concept you are inventing. So they’ll be okay with it, and when people don’t go to that, use that airline so much anymore. They drop down to the next tier. But it’s understandable, if they want to get back, they spend more money, that’s the way it goes. But yes, max out your top customers. Make the most of them, they are top customers for a reason. Check them out, know who they are, keep that list updated all the time, it will change. Tomorrow, remember last Wednesday, we had the fantastic Andre Chaperon, who I reckon is the best email marketer, marketing person going. Well there is another one, tomorrow we have Ben Settle. Who is the other, he does it slightly different to Andre. They both know each other, they are on the different sides of Atlantic, but they both are fantastically impressive. You need to be listening to what Ben says tomorrow. I’ll be back with you on Thursday.